You might be wondering why we include French lessons in our Residential BASI 1 and 2 courses. After all, it isn’t until BASI Level 3 ISIA that you need to pass a Second Language test. So why do we provide weekly language lessons for our trainees? To be the best instructor you can possible be, you need the full package. That means high-quality training in piste skills, off-piste and avalanche safety, racing, first aid, teaching and yes, French lessons! Being able to speak the local language opens many doors – it allows you to build a good relationship with other instructors, your local community and even teach French-speaking clients. Some ski schools only hire French speakers so it creates more opportunities career-wise too. Lastly, if you do plan to go the full way and acheive your BASI Level 4 ISTD, you’ll need to prove you can speak a second language. Why not give yourself the best chance possible of passing first time by getting started early? New Generation has ski and snowboard schools in 3 different countries, plus our team is from all over the globe. From Manchester to Melbourne, we have instructors and staff who all work together regardless of cultural and geographical boundaries. That goes for our resorts too – it’s really important for us to become part of our local communities. The easiest way to do that is to get chatting! Therefore teaching our students and future instructors the language of the country they’re training in comes as a priority. If one of your clients or someone in your party is hurt, you will be able to phone the Piste Patrol. With you new skills you can explain exactly what happened, what you need and where you are. Combined with your First Aid skills, you have every tool you need. Being able to safely get someone who is injured off the mountain is a valuable skill. That’s why we make it a priority. 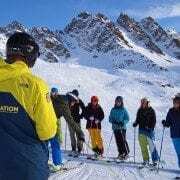 Our dedicated French teachers in the 3 Valleys and Verbier will guide you through the useful phrases you need to get by in France, and not the usual school French – “J’ai un chat noir” isn’t so useful in a ski resort! Instead, you’ll be taught valuable everyday phrases and conversation, like the weather or the snow conditions. No more sitting in silence on ski lifts. We aim to give you all the tools you need to be successful – language lessons are just one of them.